Girls and boys who enjoy getting out on the courts will play at least one game per week. Game schedules are subject to enrollment in each league. League Play will be one game per week. Game schedules are subject to enrollment in each league. You will receive your game schedule from your coach during practice times. Monday, Tuesday, Wednesday and Thursday nights—Sites and times to be determined. Times and schedules to be determined and teams will be capped at 10 players per team. Fee of $85 per player goes into effect after OCTOBER 4. Teams will be determined by DRAFT ONLY on tryout day. Coaches will call each player with team and game details. 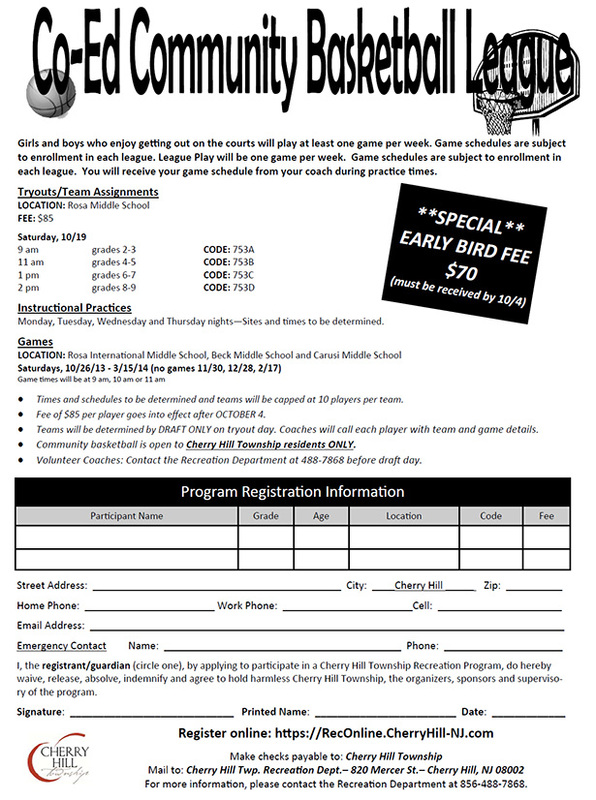 Community basketball is open to Cherry Hill Township residents ONLY. Volunteer Coaches: Contact the Recreation Department at 488-7868 before draft day. For more information: 856-488-7868 or Recreation@CHTownship.com. This is just a sampling of classes, for a complete schedule visit https://reconline.cherryhill-nj.com or view the brochure online at www.cherryhill-nj.com.